Looking for a perfect, affordable eco-friendly baby gift? You can’t go wrong when shopping on Body Sense. Body Sense makes it easy to shop for safe, natural products by placing the Environmental Working Group (EWG) hazard score on each product page. No need to bounce back and forth between websites for find out if a product is actually “natural” or “healthy”. Many companies sell products they describe as “natural” or “organic”. Some of them are even certified “natural” or “organic” by independent entities. But what do these words really mean? Unfortunately, they are sometimes used too loosely and can be misleading. After all, arsenic and lead are “natural”! At worst, these words can be inadequate proxies for the safety of you and your family. Body Sense sells only products rated by an American non profit organization as having the lowest-hazard potential, on a three-level scale. You will never find a product rated “moderate hazard” or “severe hazard” on our website. A sunny, golden yellow balm with the subtle scent of Chamomile and Calendula. These are very safe herbs, traditionally used to calm and soothe babies, and ideal for baby skin care. This is also an excellent product for people with sensitive skin or with skin conditions. 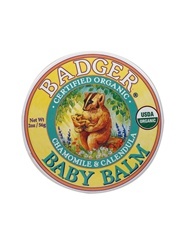 For babies, use it to prevent and soothe the itching associated with diaper rash and cradle cap. Calso be used for a soothing baby massage. Soft rib knit babybodies work great with our organic trousers or a pair of jeans. Buttons at the bottom help with easy diaper changing. Made with the finest 100% Organic Egyptian Cotton. Undyed natural. I love both of these products, although I could not find the actual gift set on the Body Sense website. Fabulous! Thank you for the great info.